There are at least 7 groups with this name: 1) A Japanese pop duo comprised of micco (vocals) and Tatsuya Kikuchi (guitar). They are best known for performing the ending songs for the anime series "Hidamari Sketch" and "Kamichama Karin," as well as the opening song for the anime Kimikiss Pure Rouge and the ending theme for Hatsukoi Limited. They released three singles (Mebae Drive, Kuuchuu Meiro, and Aozora Loop) in 2007 and released their first full album, titled Nijiiro Humming, in February 2008. 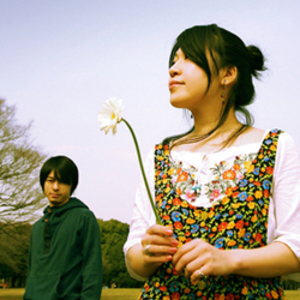 1) A Japanese pop duo comprised of micco (vocals) and Tatsuya Kikuchi (guitar). They are best known for performing the ending songs for the anime series "Hidamari Sketch" and "Kamichama Karin," as well as the opening song for the anime Kimikiss Pure Rouge and the ending theme for Hatsukoi Limited. They released three singles (Mebae Drive, Kuuchuu Meiro, and Aozora Loop) in 2007 and released their first full album, titled Nijiiro Humming, in February 2008. 2) Young multi-instrumentalist Alex DeWahl is a musician and producer known as Marble. Creating atmospheres that fill the room, he distinguishes himself with textures of crisp glitched-out rhythms coupled with the soothing sounds of pleasant melodies. His experimental approach toward song-writing drives in a variety of influences that fall together in a style of his own; blurring the lines in electronic music. The use of DeWahl's acoustics and swelling vocals bring more life into the psychedelic-tinged character of that which is Marble. Pick up his debut EP, ?house music? out on Relief in Abstract Records. 3) A new wave band from Stockholm/Sundsvall, Sweden. Most famous for their hit single ?BAM!?. 4) An Italian power metal band. The very beginning of the story took place in spring 2003, when drummer Mirko and bass player Daniel met in a lonely night, in front of some beers, in Mortara, thanks to a friend of them. Soon they discovered that they had the same will to make heavy music, a genre so far away from the musical background and tastes spread over that area (where only follow pop, disco and folk music are performed). Their common intent was to form a band to play stuff in the footsteps of Stratovarius, Sonata Arctica and Symphony X. Soon Omar, that had played with Daniel in a gothic band some years before, entered the band as guitar player, Jacopo as a keyboard player, and Annalisa as the vocalist. They started their live career at the Ep Metal Fest in Mortara (PV), thanks to the support of Entrateparallele.it, that created the event. Then after Paolo took part to some summer shows he entered as lead guitarist to complete the band. In the heart of winter 2005 Marble started the recording session of their first demo, called "Trails of Dreams and Reality", that synthetizes their idea of melodic heavy metal. 5) A pop-punk band in the 1990s. 6) A prog rock band from the country of Montenegro. 7) A Japanese rock band, which released an album called Naked.